From ancient times the people inhabiting the Balkans have been highly susceptible to different cultural and economic influences. Its turbulent history has left the varied landscape of local ethnographic specialties, enigmatic antique findings, and unsuspecting huge variety of traditions. With this intensive itinerary, we utilize your time to visit the most important and memorable sites in just four full days of sightseeing. There are astonishing experiences ahead of you in a tour specially designed to exceed your expectations. Today you will join our best selling day tour to Rila Monastery and Boyana Church and receive an extension with a guided tour of Sofia. Pick-up and drop off from your hotel is included. 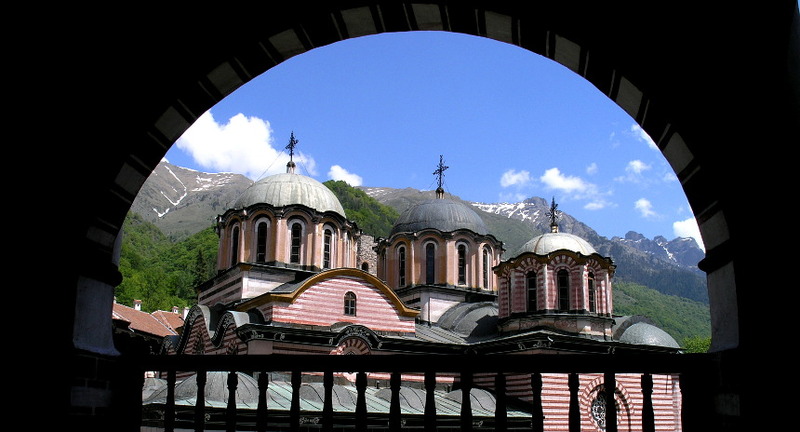 Rila Monastery (10th century) impresses and expires with its baroque arcaded balconies, masterfully decorated main church (19th century) and its supreme location among the over 2000 m asl peaks of a nature park. Tour of the history museum, which among other interesting exhibits presents the amazing Rafael’s Cross, a wood carving masterpiece made over 12 years of hard work. Boyana Church possesses unique frescoes dated back to 1259. They have features of a Renaissance artwork, but actually, predate the Renaissance period that was started in Italy. Today you will join our long, but a very rewarding tour to Plovdiv and Koprivshitsa with pick-up and drop off from your hotel included. Plovdiv – the artistic capital of Bulgaria. A guided tour of the Old Town – an architectural complex of medieval churches, neat houses from the late Bulgarian renaissance and numerous well-preserved Roman buildings (2-5 century). We visit the ethnographical museum located in a revival period house with 130 windows! Internationally famous painters and artists find their inspiration and muse in the Old Town of Plovdiv. A cup of aromatic coffee from some of the shops with breathtaking views over the town and then we continue along the cobble streets towards the Main Street and the modern center. Free time. Transfer back to Sofia. (B/-/-) * A wine tasting in a famous winery near Plovdiv can be organized upon request. Additional payment is required. ** A folklore evening in Sofia can be organized upon request. Additional payment is required. 1 pers. - 540 Euro; 2-3 pers. - 310 Euro/pers. ; 4-7 pers. - 270 Euro/pers. ; 8-12 pers. - 250 Euro/pers.